Every dog deserves a good veterinarian to help it stay healthy. As a pet owner, you also deserve a veterinarian who meets your needs a well as your dog's needs. Your veterinarian is your other family doctor, so you want to find the right one. Here's how to go about finding the right vet for you and your family. There are many different types of veterinarians out there. There are also a lot of different veterinary facilities. Remember that your vet will come with a staff, facility amenities, and more. Decide what matters most to you. Are you looking for a highly skilled vet in a state-of-the-art facility that offers a personal touch? Or, would you prefer a quick, inexpensive vet visit with a no-frills approach? Of course, there are options in-between. Cost is almost always a concern, as well as location, but these should not be the only things you consider. Make a list of your ideal veterinarian's attributes in order of priority. Once you have an idea of what you need in veterinary practice, it's time to do your research. In selecting a vet, you need to spend some time and energy to make the right choice. As you gather information, make sure you have some essential questions and concerns about the choices. Friends, family, and neighbors may offer great insight when you are searching for the right veterinarian. These are people you can usually trust to tell you the whole truth about their experiences, both good and bad. You may also consider asking trusted professionals/businesses in your area if they recommend and specific veterinarians. Ask why they recommend that vet so you can determine if the qualities they describe align with your personal needs and wants. Review websites like Google and Yelp can give you a good idea of what it's like to be a client at a given vet clinic. Read the reviews and don't just look at the ratings. Just remember to take what you read with a grain of salt. One or two scathing or glowing reviews usually represent an exception to the rule. If the majority of reviews are good, they can give you a somewhat clear picture of what to expect and multiple negative reviews present a red flag. Once you have narrowed it down to a few choices, go online and visit the website of each clinic. Read about the veterinarian's education and background. If there are multiple veterinarians at the location, look at them all. Consider whether you would be willing to see different vets or if you prefer to see the same vet each time (most clinics are happy to accommodate this and only schedule you with the vet of choice). If available, look at staff bios and facility photos. What is the general feel of the website? Does it convey the feeling you wish to get at your vet's office? Call your top choices of vet offices on the phone and ask about their services. Ask questions about the items on your list of valued veterinarian/animal clinic attributes. Consider the way you were treated on the phone. Do you feel that the staff member genuinely wanted to help you? Were your questions answered? With or without your dog, go to the clinic and check it out. 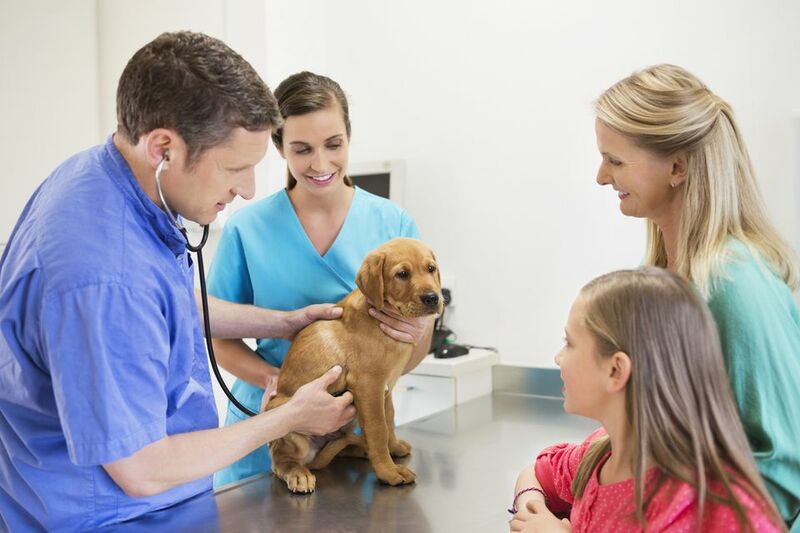 You will probably need an appointment in order to see the veterinarian but support staff or management should still be willing to show you around and talk to you about the clinic's services. You may opt to just schedule a routine wellness exam so you and your dog can meet the veterinarian and decide from there if you wish to keep going to that clinic. When visiting the clinic, ask yourself it if has the signs of a great animal clinic. Does the vet have the signs of an amazing veterinarian? It's probably best to leave your dog out of the equation until you find a vet you like. It will only confuse and stress the dog out if you are bringing your dog on multiple visits to meet a vet. And, if the vet you have selected is not ideal or not working out, don't worry too much. Refer back to your research, pick a new vet, and move on. Do pick someone as soon as possible; you don't want to be a dog owner without a vet on standby for any health problems. Why Is My Vet So Expensive? Do Dogs Need Vitamins and Supplements? Can You Give Your Dog Benadryl?